Derek Pratt shortly after arriving in Washington, D.C. on July 22. This summer, Derek Pratt spent an entire month fighting homelessness with his feet. Step after step after step. Uphill and downhill; across a mountain range; through heat, humidity and storms. For 27 days and nearly 450 miles, from Cleveland to Washington, D.C. 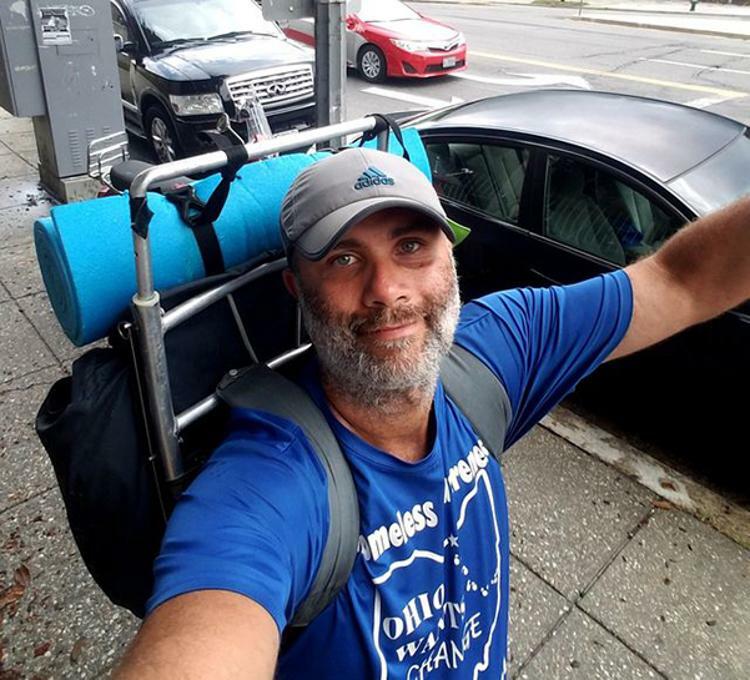 The 2004 graduate of Cuyahoga Community College carried a 40-pound pack on his back, enduring blisters and muscle cramps, for one reason: he had once been homeless himself. Pratt, 43, of Brunswick, dropped out of high school and has lived on his own since the age of 16. But he turned his life around. He received his GED at 19, enrolled at Tri-C in his mid-20s and earned an associate degree in IT. He later earned a bachelor’s degree in IT from David N. Myers University and a master’s degree from Strayer University. After 12 years in IT and human resources, Pratt decided to pursue the battle against homelessness full time. He left his job and began working as an advocate for people living in apartment communities — mainly subsidized housing — and as a mediator focused on landlord-tenant issues. In January, he launched 4Ward With Purpose Inc., an organization that provides services that help overcome barriers to housing stability. “One of our main areas of focus is building partnerships within communities to help provide housing stability and homeless prevention services,” Pratt said. Why walk almost 450 miles? Simply put, it’s more effective than handing out flyers. By the time Pratt decided to walk through four states to the conference, it was already June. He only had a few weeks to prepare. With the help of family and volunteers, he began raising funds, built the website walk4change.life, planned a route and began finding places to sleep each night. Starting on June 26 from Scranton Flats, on Cleveland’s near west side, Pratt took the Ohio and Erie Canal Towpath Trail south through Peninsula and Akron. He walked into southeastern Ohio before turning east into Pennsylvania. He walked through Pittsburgh, then began heading southeast on the Great Allegheny Passage into Maryland, briefly crossing into West Virginia as he traversed the Appalachians. Each night, Pratt’s mother arranged for him to sleep at a church or homeless shelter. Pratt stayed at campgrounds along the trails when a shelter or church was not available. It’s about 400 miles via the most direct route from Cleveland to Washington. Pratt’s route tacked on an extra 50 miles as he opted for trails and back roads — both to stay away from heavy traffic and to meet new people, sharing his story and raising awareness about his walk. Pratt also accepted small donations along the way. One donation story in particular stuck with him. The man gave Pratt $20, but he was moved even more by the gesture of the man’s young daughter. But homelessness in America won’t be solved just in offices and conference rooms. It will take the work of entire communities to address a complicated problem with many causes.